Our creamy and crumbly fudge originates from Devon in the West Country and is freshly made with natural ingredients every day in our shops. Roly’s Fudge Pantry’s reputation for delicious crumbly fudge prepared in full view of our customers makes us one of the most unusual and popular shops on the high street. 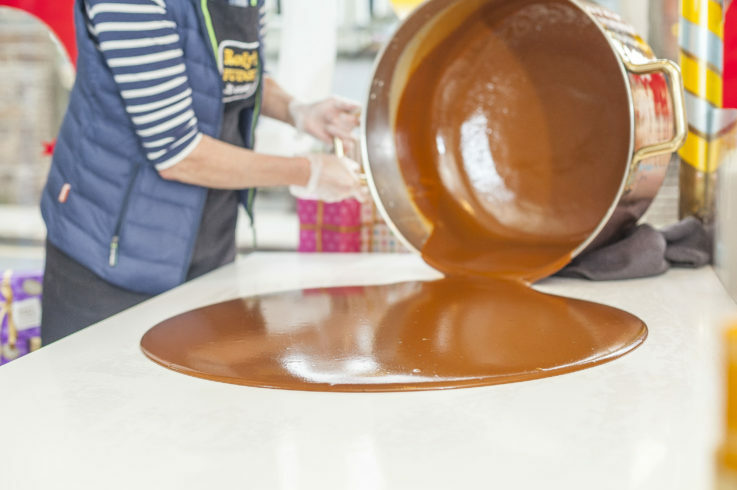 At our Roly’s Fudge kitchens, our fudge is made freshly every day in small batches to ensure maximum taste. 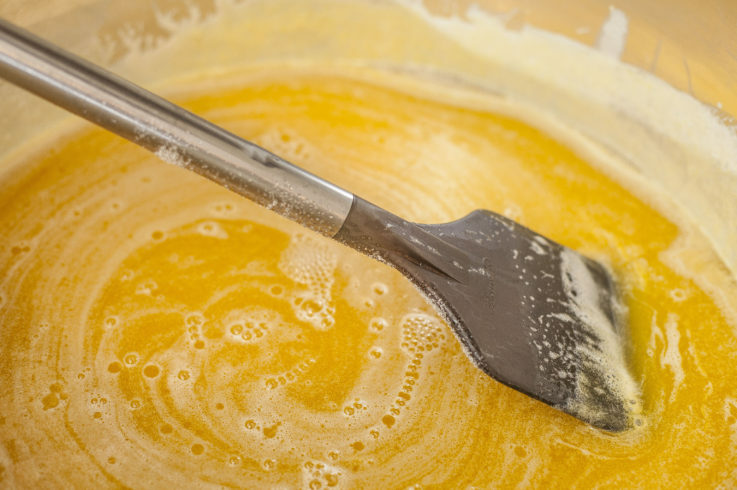 Our traditional recipe, using recipes sourced from the grandmother of the founder, is simply butter, milk and sugar. 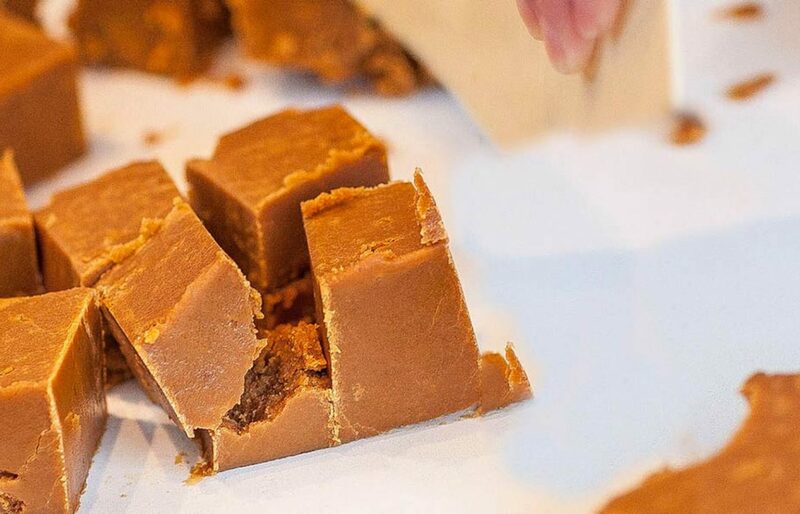 We never put unnecessary additives, vegetable or palm oils, or artificial colourings in our fudge. The Roly’s classic flavours use natural and authentic ingredients, from maple syrup and whole crunchy walnuts in our Maple & Walnut Fudge, to real dark rum and juicy raisins in our Rum ‘n’ Raisin Fudge. Roly’s Fudge does not need to be kept refrigerated and if the fudge is kept at home in sealed containers it will last for at least 2 months (…self control permitting!). Trading since 1987, we’ve spread from a single West Country shop to outlets across the UK. 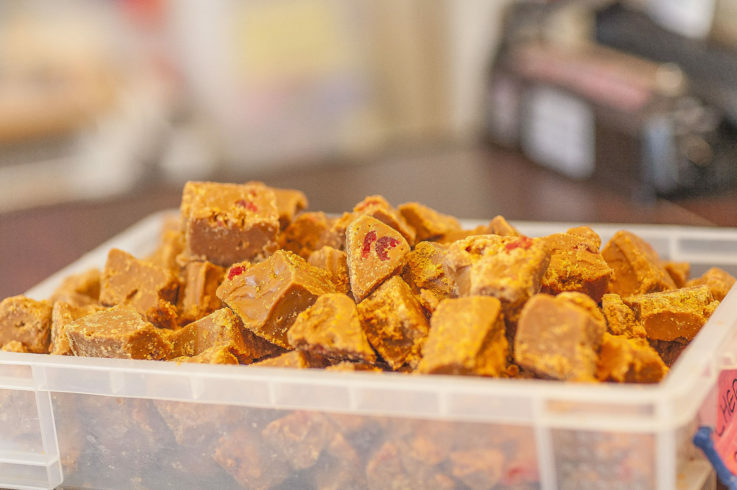 Right now there’s over 40 Roly’s Fudge shops operating across the UK from Cornwall to the Lake District, independently run by families who love our fudge. With tasters available to sample before purchase, we now have thousands of Roly’s Fudge addicts! Recently we’ve also introduced a dairy-free fudge range. Made using organic ingredients, including fine cashew butter and soya milk, it is fully accredited by the Vegan Society. Feel free to visit any of our shops for your free Roly’s taster! Alternatively, you can buy our fudge online in gift-wrapped boxes, with over 15 flavours to choose from. Our story began over thirty years ago when Peter Riley and his wife Lindsey began producing natural fudge in the farmhouse kitchen of their 16th century thatched cottage in Mid Devon. They decided that their fudge should contain all natural ingredients whenever possible, and that it should be made only in the traditional way. To do this, a large copper cauldron was bought from an antique shop in a market town in East Devon. 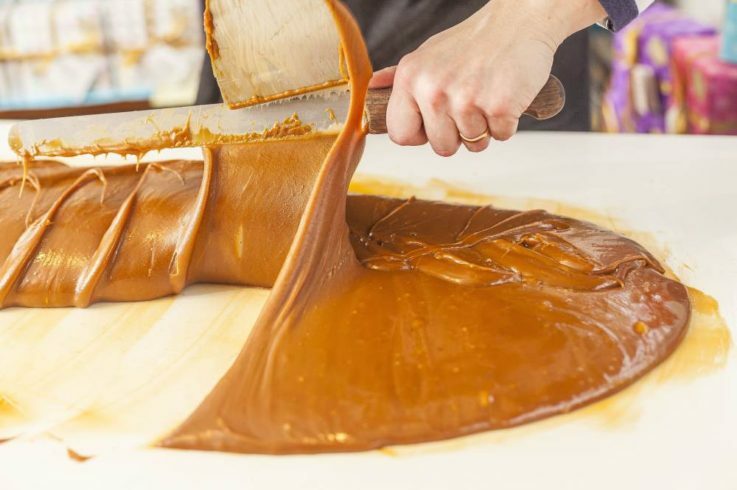 Their kitchen marble slab was cleaned and sterilised and, using Lindsey’s grandmother’s own recipes, the first batch of Roly’s vanilla fudge was produced. Cooking by hand in very small batches and using lashings of Devon butter, they found the process, although time-consuming and requiring a great amount of dedication, was simple, and produced a delicious and unique Devon taste. However, as with many simple foods, making them outstanding requires much honing! 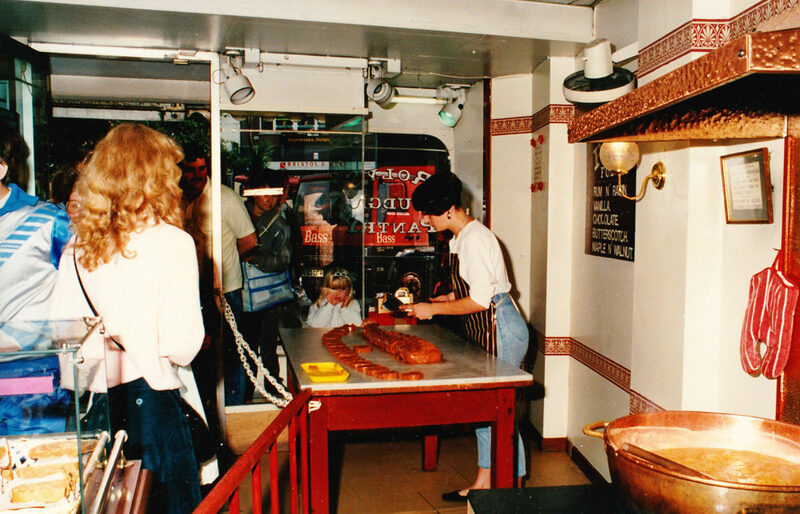 Our product testing took several weeks, and the first Roly’s Fudge Pantry was opened in Torquay in 1987. 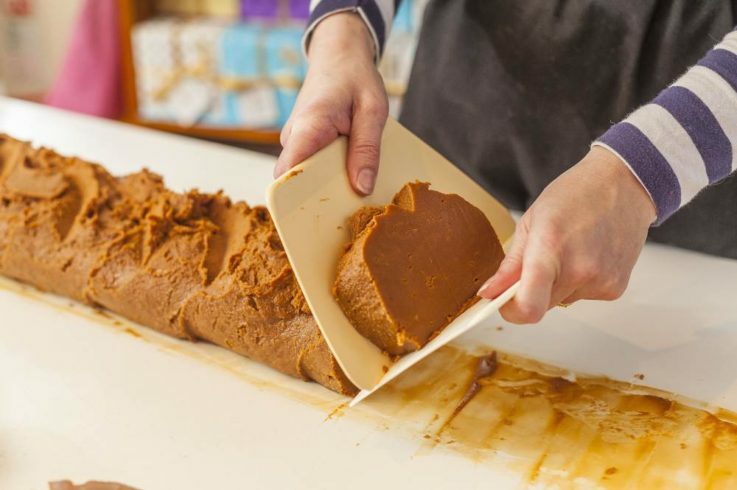 As it begins to set into shape, we slice the baguette of fudge into large slabs. 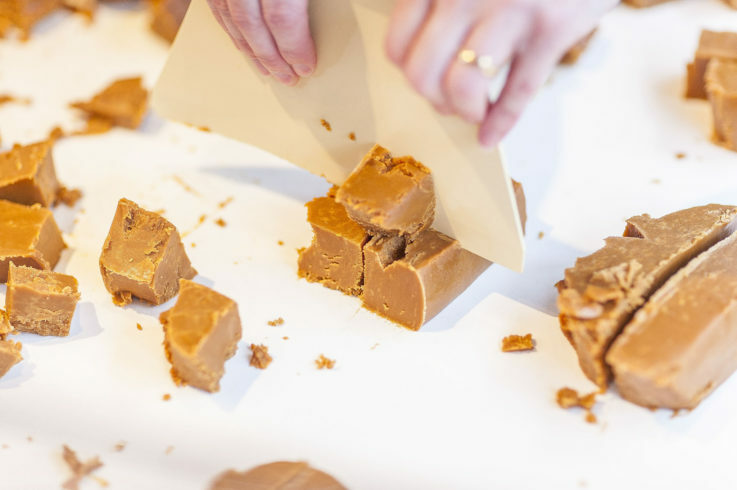 Once the fudge cools into its characteristically crumbly texture, we cut it into pieces. It’s ready to eat! As we can cook up to several batches every day, your fudge will always be fresh.